Pilgrims and travellers! 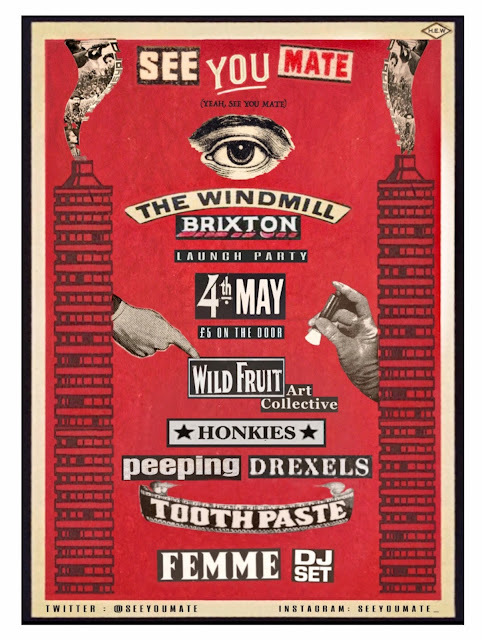 Our voyage into the physical world begins this May, at Brixton Windmill. Come and join us, as for a mere £5 you can get a wealth of great bands and hear a wealth of great tunes. Fight not the monsters, lest ye become a monster! Cursed Liverpudlian garage reptiles, here to spread northern disharmony and rock 'n' roll chaos. Synth-infused honky-tonk rancheros from South of the River, anybody that's seen this lot know what a truly special group they are. Like Waylon Jennings on quaaludes. An ungodly plague from SE, Peeping Drexels make "music for horrible people" (in their own words) and "stomping garage rock with a penchant for the macabre" (in our words). Minty fresh dream-pop, Toothpaste deal in textures and timbres most luscious, and tilted lullabies not to be lost in translation.